This is by far the best place for an ice cream in Puebla. It is located in Sonata which is a really nice and new place to be. I used to work in an office upstairs in Plaza Opera and went for an ice cream almost daily. I tried every single ice cream they had until I found my favorite. The Mango flavored Ice Cream is by far the best one you'll ever have. I've tasted lots of mango flavored Ice Creams in my life, but this one has no comparison. I asked how the ice creams are made and they are prepared with natural ingredients blended with the materials needed to last. You can even see in the back of the locale how they prepare them. This is why it tastes so good and makes you always want to come back. They don't always have the same flavored ice creams, so be sure to ask if they have the Mango flavored ice cream and I'm sure you won't regret it. 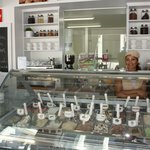 Been to Biancolatte Gelato & Caffe? Share your experiences!